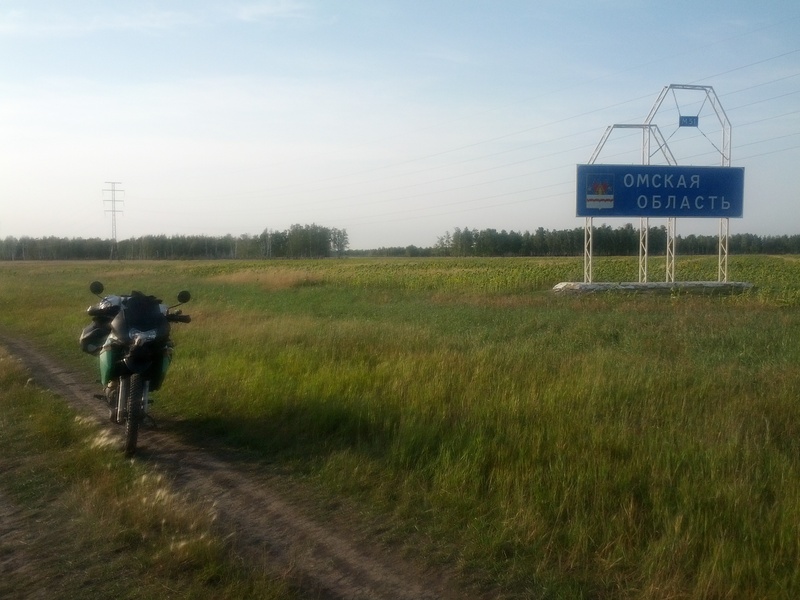 Reaching the Omskaya Oblast was a challenge today. The flat landscape laid the way for a strong cross/head wind, which was against us all day. The headwind component robbing power from the engine and making it physically tough on the neck and shoulders. The crosswind component was the worst though. Winds crossing from left to right meant riding on a lean to the left. Trucks coming the other way (of which there were many) had their advancing pressure wall blown across my path. The resulting turbulence was extreme and meant 2 hands on the bars at all times. The road being long, straight and flat meant lots of overtaking, where oncoming cars can be seen a long way off. It’s a recipe for accidents, I’d had to move towards the gutter a few times. My sidestand switch started playing up causing a miss-fire, usually when passing a truck and I needed power the most. I swiftly dealt with that problem before it killed me! In all it’s petty much just been a day of riding. This sounds slightly miserable. But it’s all part if the ride! 방랑 on!